Today's Draw: Strength from the Art of Life Tarot in the Lesson position from the Deck of 1000 Spreads. What superpowers have you developed in your lifetime? Are they impervious to attack? Or could something quietly worm its way in just enough for a speck of kryptonite to flow in? I have this really cool superpower. I can allow certain types of thoughts and fears (certainly not all types...I'm not THAT good) to pass through my mind with non-judgment. By that, I mean that instead of entertaining a fear and allowing it to swirl out of control in my head, I can note it and let it flow out of my head as quickly as it flowed in. I don't judge it true or false, good or bad, scary or pleasant. It is what it is. A thought. This is a superpower, because I used to be one of those people who over thinks things and worries and allows fears to take over. Then through divine means (and a long-lived meditation practice combined with conscious discipline), I found myself nearly impervious to fear-based, catastrophic thinking when it came to money, my career, my creative talents and other aspects of the professional part of my life. I did this just in time to become a freelance writer, supporting a rag-tag pack of dogs through two recessions and countless other challenges. See, there are consultants who get gigs that last for six months with guaranteed income. Then there are consultants who earn their mortgage a quarter-hour at a time. I'm the latter. It can be hard to survive as the latter in a competitive, uncertain landscape like advertising. I know of very few people in the marketplace who have lasted as long as I (as an aging single person in a young man's game with no other stream of income or support.) I say all of this not to brag, but to paint a picture of how truly awesome my superpower is, and yet how vulnerable it can be under the right conditions. See, this weekend I was minding my own business when I inadvertently allowed a couple of fear-based, self defeating thoughts to creep into my head in regard to my capability, competence and future as a creative writer. It's not like I came into contact with kryptonite or anything. It was the same kind of stimuli that had bounced off my brain of steel many times in the past. But somehow, something breached the perimeter and started working on me. 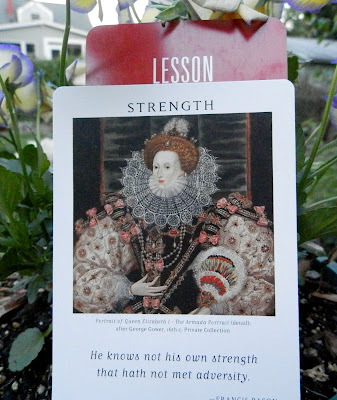 So the timing of this Strength card with the Francis Bacon quote, "He knows not his own strength that hath not met adversity," is perfect. It reminds me why certain things happen. Without being tested you forget a superpower is a superpower. Adversity comes to us for a reason. It shows us where we've left ourselves open...or where we've lost our vigilance. It's the first Seal Team...the one that opens the door just wide enough for the second Seal Team to roll the kryptonite in. So this weekend I had some pre-adversity. It didn't really work. I was over it by today. But it was working on working. For you it could be the thought that sends you in a downward spiral toward depression...don't entertain that first thought. Or it could be the conflict that makes you think about smoking after 20 years...close the door and lock it. Or it could be something that sends you back into the arms of a toxic old lover. It could be anything. But it will come with a whisper first...a whisper subtle enough to charm the door open for your kryptonite to roll in. On one hand, the whisper seems evil and divisive. But in actuality it's the Jor-El to your Kal-El (look at me and my Superman geek talk!) It's an early warning system that could keep you out of more dire circumstances ahead—adversity enough to keep you forever connected to your own super-human strengths.